I like bad weather and I’m not sure why. Maybe it’s the raw, sublime beauty of it. More likely, it’s a form of meteorological Stockholm Syndrome. I’ve lived in Britain long enough to appreciate being constantly rained on (at least until Summer when my face melts off onto the pavement). But the bad weather I’m talking about lies in the Goldilocks zone. I want neither the tacky Clintons Christmas card nor the photoshopped Thomas Cook travel brochure. No, I want that grey zone, that drizzle into downpour. In Metro Exodus, I found the sogginess I long for. Metro Exodus is the first of the underground transit shooters that is not set in those titular tunnels. Moving away from Moscow, a dynamic weather system proves that Russia’s open-air landscapes are just as dangerous as the subterranean complexes you leave behind. The first kind of extreme weather you encounter is a blizzard, which acquaints us with the game’s short-sighted thugs in an introductory stealth level. But snowstorms aren’t new to Metro; previous games flirted with excursions into wintry urban ruins. It is the Volga river basin, Exodus’ first proper open-world area, that offers the first real form of dynamic weather. The climate in the Volga is damp, bitter and as depressing as a Scottish Summer. The whole environment reminds me of years I spent living on a remote island in the Outer Hebrides. My granddad described my temporary home as “bleak” every time he visited. Despite that, I’ve always been drawn to grey and exposed landscapes. There’s even a great Scots word that defines the kind of atmosphere we find in the Volga: “dreich”, an adjective for places where the weather is particularly cold, wet and dreary. Trudging through the Volga’s snud (snow + mud), a storm might stir on the horizon before suddenly sweeping in. These feel like a nod to the weather effects of that other Ukrainian post-apocalypse, S.T.A.L.K.E.R. They’re also an attempt to cement the environment as hostile to the player. Rain makes it harder to see and, if you’re wearing a gas mask, forces you to continually wipe away watery droplets and muddy globules so that you can actually see what you’re shooting at. For these reasons, being caught in a storm should be frightening, but I find it brings a moody kind of comfort. You can appreciate the bad weather from a screen’s distance away, like sitting by a window and listening to the rain lash against the glass, or huddling in a tent on a wet day. Submerged in thunderstorms, Metro’s terrible weather makes the warmth of the campfires that much more inviting. The safehouses, spread out in the wilderness like Highland bothies, shelter you from the howling gales as well as the Zone’s anomalies and mutant dogs. 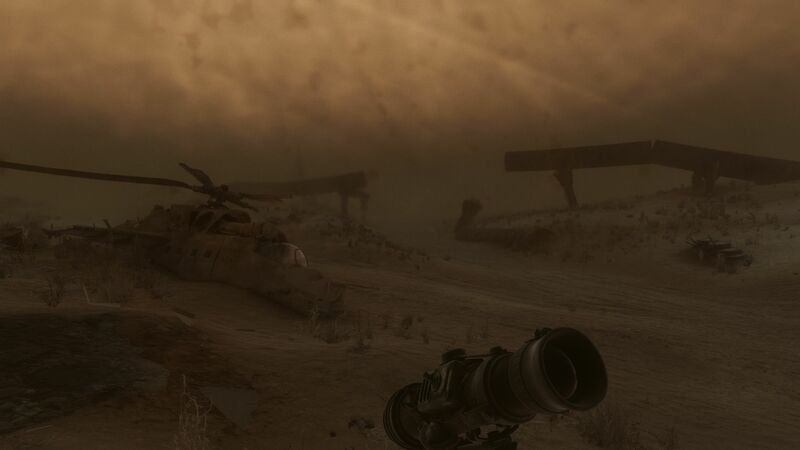 Exodus’ second area, the Caspian desert, features a different kind of weather: sandstorms where the wind howls and causes the foundations of buildings to tremble. When either of these forms of extreme weather appear, I always feel inclined to scramble towards the nearest sanctuary. Within the hidden cubby holes of overturned train carriages and rusted ships, you can clean the grit from your gun or rest on the canvas bed. Or you can sit and listen to the thunder and rain, or the sandstorm’s whistling wind, sipping from your canteen of Vodka. 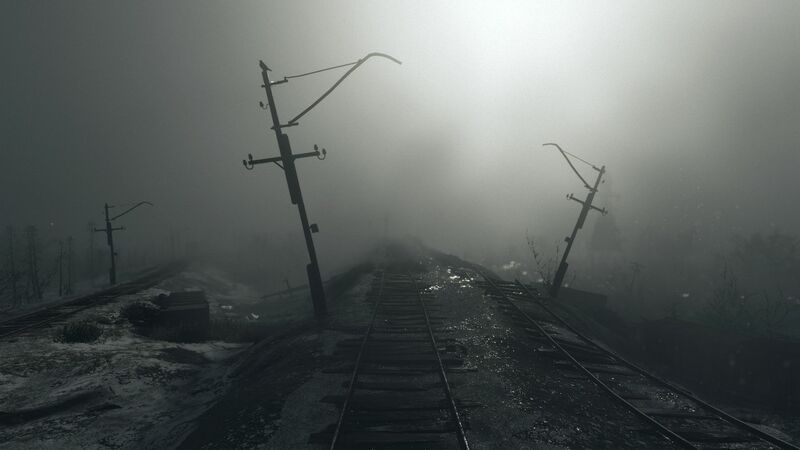 For me, it’s as clear as day: Metro Exodus wouldn’t be the same without its crap weather. Tagged with 4A Games, Deep Silver, feature, The Joy Of, Metro Exodus.